We welcome any comments, feedback or requests you may have. Click the Contact Me link above to have your say. The main online catalogue for Pendraken Miniatures 10mm	wargame models, owned by	Dave	Pengilley. Contains full lists of all	Pendraken's 10mm ranges from Ancients	to Fantasy and Science Fiction - plus everything in between! You can also safely buy on-line	from this site	too. 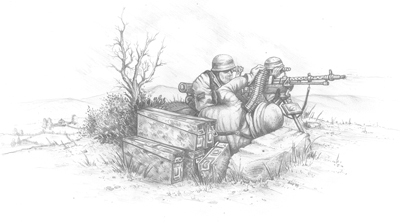 This is the official site, by Pete Jones, for	Blitzkrieg	Commander – Fast-Play	Tabletop Wargame Rules for Combined-Arms Operations, 1936-45. You'll find plenty here	including Rules Additions, Forum, Gallery and Downloads. A great website and a great	set of rules allowing	you to re-create battles	of the Second World	War and	Spanish Civil	War using miniatures on a tabletop. Home also to Cold War Commander rules set – allowing you to re-create battles from the First Indo-China War right up to the present day using miniatures on a tabletop. Command anything from a company right up to a division and get a result in 2-3 hours without becoming bogged-down in detail. Suitable for any scale miniatures from 2mm right up to 28mm and no re-basing required. The Wargames Journal site is a great source of scenarios, ideas, wargaming articles, etc. Just packed full of wargaming stuff, covering all eras. Dazza's 10mm Miniature Armies site is a great source of inspiration for painting Pendraken's 10mm WW2 models. Some good stuff on show here, well worth a visit to Darren Crump's site.